Kaha Lani resort is truly Kauai's best kept secret. 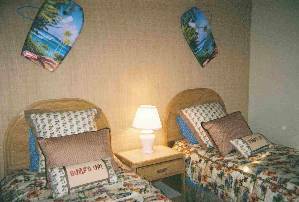 It is private and secluded but centrally located for the best vacation convenience on Kauai. Nestled in lush tropical landscaping, this ground floor apartment has no stairs. 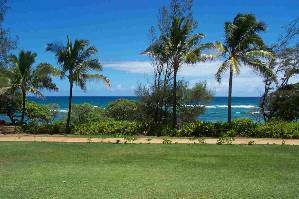 It is just a few steps from the lanai across the manicured lawn to the white sand beach. Stroll north to the famous Lydgate Beach park with safe swimming (year round with a lava rock protected salt pond and lifeguards). Or, stroll south by the adjacent Wailua golf course. 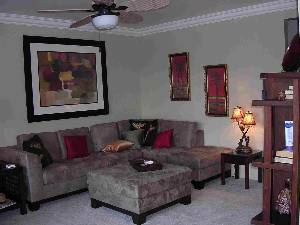 Inside, the luxury condo offers 2 bedrooms, 2 baths, full kitchen, dining area and living room. Maximum number of guests is 4 adults and two smaller children (using the day beds in the LR). 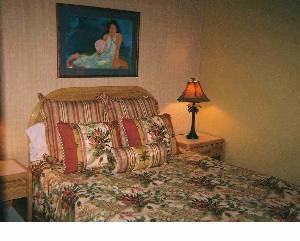 All needed amenities are provided for your pleasure. 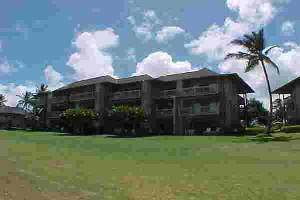 This is no ordinary condo and Kauai is no ordinary island! Watching the Sun and Moon rise. Looking directly East. Sun and Moon rises are magnificent! Bottom Right unit only steps from the beach. 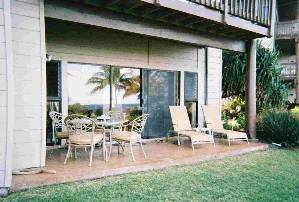 Windows and Slider to Lanai and Beach just to the right. Sofas (2) can be used as day beds to sleep up to 6. Upscale Powdered Aluminum Finish Furniture. HI Tax ID# W30069690-01 Call for last minute openings and deals!!!! Cancellations and Refunds: Cancellation fees apply, variable according to timing.